Who is happy as a clam that it is springtime? Me Me Me! I am welcoming this season with open arms here in Colorado. We, of course, still get lots of snow in the spring time and although I love the moisture and our state desperately needs it I am also ready for some warmer temps so we can get outside and do something! Especially because my boys are bouncing off the walls and driving me bonkers…lets be honest. A few weeks ago we had a mega cyclone blizzard that was absolutely horrendous. Our town was shut down for two days and there were so many people who ended up getting caught in the storm and got stranded in their vehicles. We even had the National Guard come help our first responders here in our lil ol town! It was quite the doozy but we were smart enough to hunker down and relax. 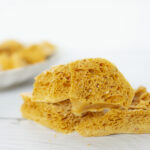 During that mega storm I was able to try some new recipes and lets just say this honeycomb candy has been on repeat over the last few weeks! It is a complete winner in my book! 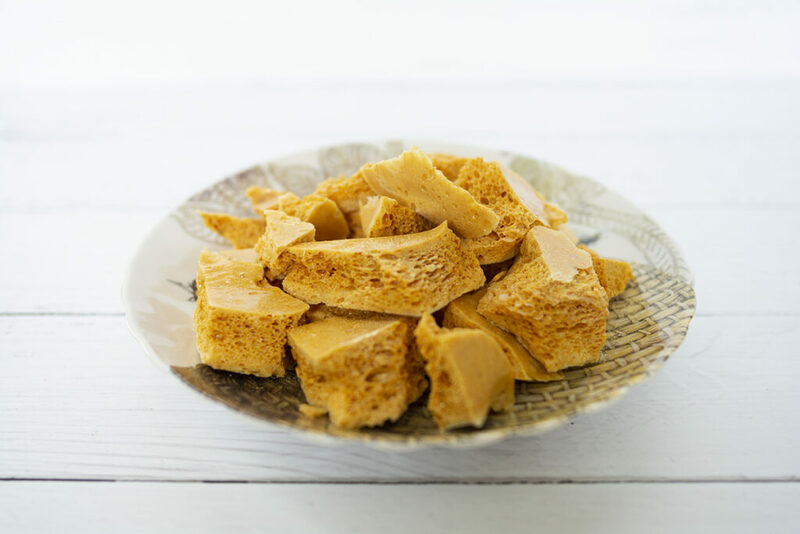 So this recipe is pretty darn simple to make and there is just something about the airy texture and of course the sweetness that has me coming back for more! 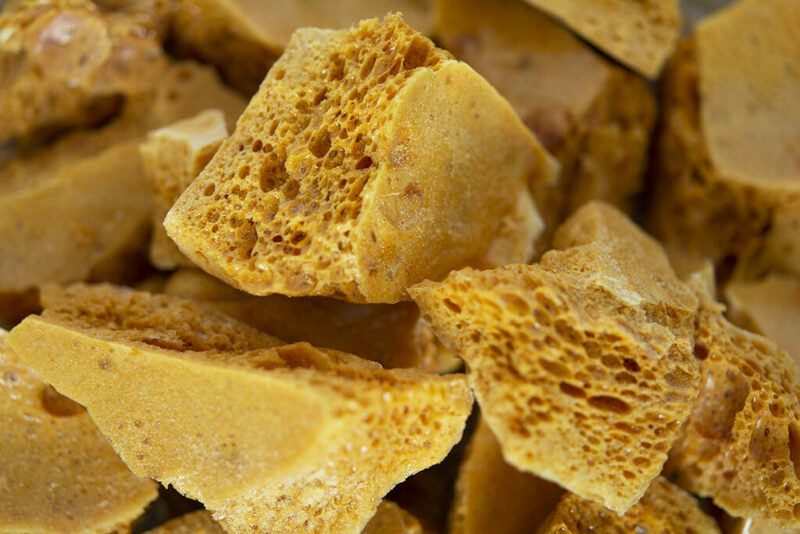 For some reason I have only tasted this honeycomb candy maybe once or twice in my life and I was always curious why I didn’t see it more often. Now I’m pretty lucky that I can whip up a quick batch anytime I want because I always have the ingredients on hand. I hope you all give this a whirl! I also think it will be good if you drizzle chocolate on top. Hmmmm…..might have to try that on my next batch! This is certainly kid, husband and father in-law approved. Make sure if you have kiddos in the house that you let them watch when you add the baking soda to the mixture. They will all love it because it looks like a science experiment! Plus your house is going to smell heavenly! Smells like our honey house and it reminds me of every time we package our honey! Something about the smell of warm honey….just brings joy to my soul. Enjoy my sweet honey lovers and I would it love if you let me know what you think! This is a light, airy and sweet treat for the whole family! Super easy to make too! Use an 8×8 pan and line it with parchment paper. 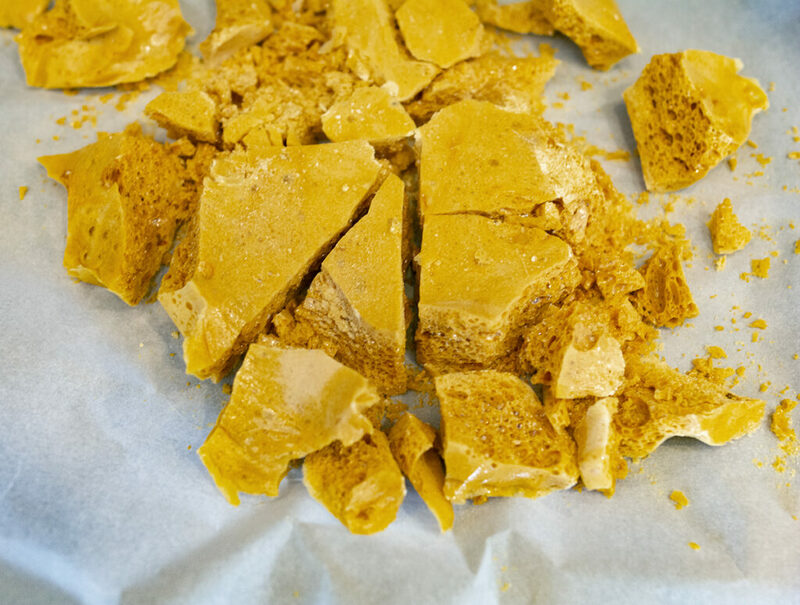 It won’t look super neat but the honeycomb mixture will weigh it down once it’s poured in. In a medium saucepan, add your sugar and give it a wiggle so that it lays flat on the bottom of the pan. Next add your corn syrup, honey and water evenly so the sugar has been moistened but PLEASE DO NOT STIR. Turn the heat to medium high and keep a watch as all the ingredients start to blend together. Cook the sweet mixture to 300 degrees F (use a candy thermometer) then remove the pan from the heat. This is the fun part! Whisk in the baking soda just for a few seconds and once it stops foaming you should quickly pour the mixture into your parchment lined pan. Store in an airtight container so it doesn’t soften from any moisture in the air. Enjoy!